It might sound improbable but it’s absolutely true- the new Lenovo Yoga is both a tablet and a laptop. The Lenovo Yoga is a technological wonder which is fast becoming a rage among the gizmo geeks and with good reasons to back it up. Lenovo has a long and respectable record of serving the world with stalwart and strong traditional PCs. But with the advent of windows 8 they have taken advantage of the demand of the consumers of windows 8 featuring gadgets. It blends the best features of laptops and tablets to give its consumers the best of both dimensions. Window 8 is an operating system that combines the new touch screen functionality with the old windows operating system so it’s something like old wine in a new bottle. The Lenovo Yoga is a multimode new age gadget which is not only lucrative but also helps you work under all circumstances with ease and comfort. With the Lenovo Yoga you can forget those days of aching backs and necks from long hours of working stiffly and enjoy working in any position of your choice. Stay in bed or be a couch potato, watch your favorite programs on TV while working in your couch on complicated projects. The Lenovo Yoga can be called the healthiest choice you can make while buying an ultra book. The Lenovo Yoga is one of the ultimate convertible ultra books and you can use it in a tent or stand mode. A simple flip can turn the laptop into a sizeable tablet. In the Lenovo Yoga 11 you will be getting a Microsoft connected standby which will enable you to be connected with the social media and your important contacts all the time, around the clock. In the Lenovo Yoga 13 you can give the gadget your commands through gestures of your hands through the webcam. The Lenovo Yoga gives you a HD experience which is quite extraordinary combined with the Windows 8 operating system. It also has a one key data recovery system in it to safeguard your valuable files and data. There are many pre-loaded features in the Lenovo Yoga like Lenovo motion control, Amazon Kindle and Skype. Lenovo offers you a great after sale service and long stretched warranty period. 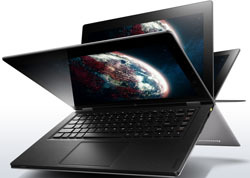 With Lenovo Yoga your investment in a multimode gadget of high quality will be secured. While the Lenovo Yoga has been advertised as a multimode gadget actually it is just a smartly made laptop. Weighing 1.54 Kg it is not as light and sleek as it would seem at a first glance. You can carry it anywhere and work on it by putting it in the tablet mode but in a crowded place it will seem that the Lenovo Yoga needs a bit too much space for free movements of your limbs. Another disadvantage of the Lenovo Yoga is that it is too highly priced and there are some other options among ultra books and think pads which come much cheaper.